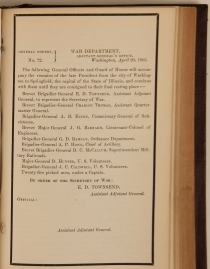 [CIVIL WAR - WAR DEPARTMENT]. Book. 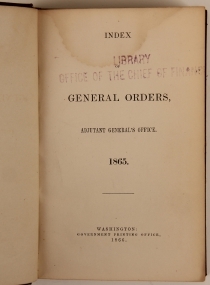 Bound collection of separately printed General Orders from the Adjutant General’s office for 1865. Containing 168 of 175 consecutive orders, and a 94-page index at front. 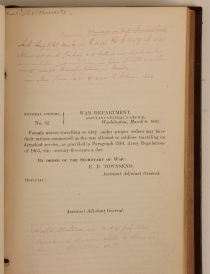 Bound for Major General William Scott Ketchum, with his name in gilt on the spine and his markings or wartime notes on numerous pages. 4¾ x 7 in. Early resolutions concern the rates of pay for officers’ servants, equal clothing allowances for commissioned and non-commissioned officers, and widow’s rights to prize money, and equal pay for both black and white volunteers (Order No. 31/Public No. 57) and freedom for the wives and children of any army or navy volunteer (Order No. 33/Public Resolution No. 25). 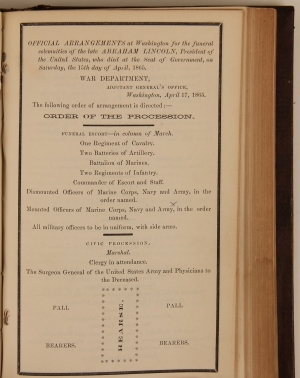 Also includes several orders relating to the assassination of President Lincoln: Order No. 66 announcing the assassination; Order No. 67 announcing Andrew Johnson’s ascent to President; and Order No. 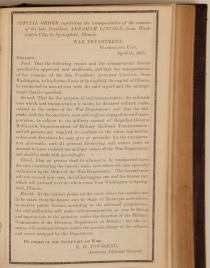 69 announcing the closing of military bases in observance of the funeral of Abraham Lincoln, with the official Order of the Procession for the ceremony on April 19th; also includes a Special Order regarding the transportation of President Lincoln’s remains to Springfield, Illinois and Order No. 72 assigning the Honor Guard to accompany the casket. 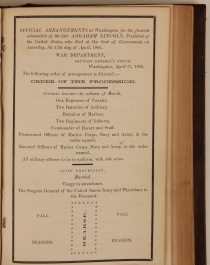 Orders signed in type by Andrew Johnson concern ending the blockade and restrictions on internal commerce (with the exceptions of weapons and gray cloth). Lacking order numbers 15, 97, 128, 133, 140, 148, & 168 (apparently never bound in). Very good. Minor rubbing, some staining to top of index pages. Later ink stamps of the Office of the Chief of Finance on front endpapers. William Scott Ketchum (1813–1873) graduated from West Point in 1834. He served in the Seminole Wars and on the Western frontier. As a captain, he fought in the 1857 Expedition against the Cheyenne and the Battle of Solomon’s Fork, where he commanded the 6th Infantry Regiment. During the Civil War, in February 1862, he was appointed brigadier General of Volunteers, serving in Washington, DC.